ClearCorrect is a “clear braces” system designed to be comfortable and virtually invisible. The ClearCorrect system uses a series of lightweight, custom aligners (clear braces) that gradually shift your teeth into alignment. ClearCorrect offers gentle realignment for teeth that are over-spaced, crowded, or crooked. Gum disease can result from misalignment, as it causes small gaps in the gums that leave open spaces for bacteria. Fixing misalignment issues with ClearCorrect clear braces also helps avoid damage to your tooth enamel. ClearCorrect clear braces adjust your bite so that your teeth fit together properly. This also protects your tooth enamel, can make chewing easier, and can ease speech impairments. ClearCorrect clear braces are removable. Pop your clear braces off before eating, then brush and floss like normal and put your clear braces back on. Metal braces are old technology. ClearCorrect uses the most modern methods of dentistry at every stage of your treatment. ClearCorrect technology provides comfortable, custom-made trays of smooth plastic that fit like a thin shell over your teeth. 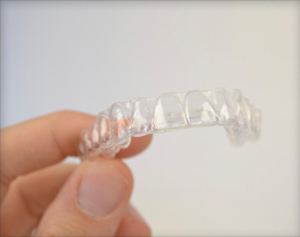 If you’ve heard of the popular Invisalign aligners, you may wonder what the difference between Invisalign and ClearCorrect is. There is actually not much of a difference between ClearCorrect and Invisalign. Both ClearCorrect and Invisalign use sequential clear braces to straighten teeth. Both ClearCorrect and Invisalign are effective and our patients have had fantastic results. Some say ClearCorrect has superior clarity and the finishing of its surface is made to withstand the clouding that can occur in plastic from general use inside your mouth. At Prestige Dentistry in Trinity and Palm Harbor, we can answer any questions you have about the ClearCorrect system and help you determine if ClearCorrect is the right choice for you. Call today for your consultation and start on the road to straight teeth and a beautiful smile with ClearCorrect if you are in the East Lake area! For more information on our orthodontic treatments and general dentistry services, please take a look at our main dental website!